The global pharmaceutical robots market is expanding owing to a robust pharmaceutical industry and benefits offered by automation in this sector across the globe. 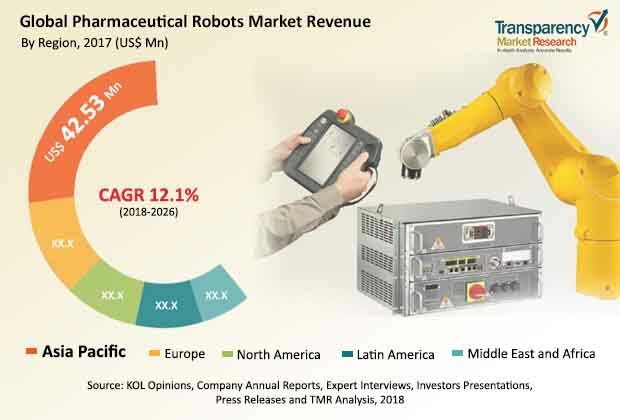 The global pharmaceutical robots market was valued at US$ 92.73 Mn in 2017 and is projected to expand at a cumulative annual growth rate (CAGR) of more than 12.1% from 2018 to 2026 to exceed a value of US$ 250.46 Mn by 2026. The global pharmaceutical robots market is expanding at a rapid pace owing to increase in penetration of robotics in the pharmaceutical sector, technological advancements, and minimization of production cost due to automation. Pharmaceutical robots are adept at performing tasks at rates that far exceed human capability. These robots are capable of functioning in perilous settings in proximity to biological dangers such as threat of radioactive contamination and toxic chemotherapy compounds. Robots are utilized in various applications such as drug discovery, pharmaceuticals, medical device manufacturing, and performing blood sample testing. Also, pharmaceutical companies are utilizing robots on a large scale for scientific research. In the field of robotics, laboratory automation is an emerging segment. Pharmaceutical robots aid in transferring and packaging materials such as diagnostic kits and assays. This helps reduce human error and permits scientists to focus on experiments. The other applications of robots include decreasing repetitive capping work, uncapping, and operation of manual pipettes. Thus, automated machines assist research scientists by easing their work and lead to rapid laboratory work. The field of robotics is seeing large-scale of technological advancements. In the field of industrial robots, pharmaceutical robots is an emerging segment. Various organizations are developing technologically advanced robotic machines, which is likely to boost the pharmaceutical robots market. For example, Universal Robots A/S introduced collaborative robots such as UR3 ROBOT that help in picking and placing, conduction of lab analysis, and injection molding, thereby transforming manufacturing units with novel technology. A large number of pharmaceutical companies are substituting traditional robots with robots that represent a combination of humans and robots, owing to their ability to offer flexibility as well as efficiency. The global pharmaceutical robots market can be divided based on type, application, end-user, and geography. In terms of type, the global pharmaceutical robots market can be segmented into traditional robots and collaborative robots. The traditional robots segment can be further categorized into articulated, SCARA (selective compliance articulated robot arm), delta/parallel, cartesian, and other robots (spherical and dual-arm robots). Based on application, the global pharmaceutical robots market can be classified into picking and packaging, pharmaceutical drugs inspection, and laboratory. The picking & packaging segment is expected to constitute a significant market share owing to high demand for personalized packaging. The various advantages offered by robots in the pharmaceuticals field include high speed, efficient track and trace, and optimal utilization of floor space. Various traditional machines, for instance VS-068A2 and VP-6242G, produced by Denso Wave Incorporated are utilized for picking and packaging. In terms of end-user, the global pharmaceutical robots market can be split into pharmaceutical companies and research laboratories. Rise in use of robots in the pharmaceutical sector owing to rise in novel drug discovery and development is leading to expansion of the market. Also, pharmaceutical companies are engaged in the development of personalized medicine as well as clinical trials, which is further benefitting the market. Based on region, the pharmaceutical robots market can be categorized into North America, Europe, Asia Pacific, Latin America, and Middle East & Africa. The Asia Pacific region accounted for a prominent share of the global pharmaceutical robots market in 2017, followed by Europe with a substantial market share. The presence of a large number of local pharmaceutical companies in countries such as Japan and China is fuelling the industrial robots market in Asia Pacific. The presence of leading pharmaceutical companies with large manufacturing units in these countries is expected to propel the growth of this region. Europe accounted for a major share of the global pharmaceutical robots market owing to high adoption of robots in in Germany. Moreover, several initiatives have been undertaken by the European Union in order to establish regulatory standards related to safety protocols in the field of robotics. North America is expected to offer lucrative expansion opportunities in the near future owing to the presence of global pharmaceutical companies in the U.S. Furthermore, there has been an increase in the rate of adoption of production automation of manufacturing units, which is expected to boost the market in North America. This report on the pharmaceutical robots market studies the current as well as future prospects of the market globally. Stakeholders of the market include companies and intermediaries engaged in the manufacturing, commercialization, providing of robotic machines for various functions, as well as new entrants planning to enter the market. The report comprises an elaborate executive summary along with a market snapshot providing overall information of various segments considered in the scope of the study. The section also provides overall information and data analysis of the global pharmaceutical robots market with respect to the leading market segments based on type, application, end-user, and geography. The global pharmaceutical robots market is segmented based on type, application, end-user, and geography. Based on type, the market has been categorized into traditional robots and collaborative robots. In terms of type, the market has been classified into articulated robots, SCARA (selective compliance articulated robot arm) robots, delta/parallel robots, Cartesian robots, and other robots (spherical and dual-arm robots). Based on application, the market has been divided into picking and packaging, pharmaceutical drugs inspection, and laboratory applications. In terms of end-user, the pharmaceutical robots market is split into pharmaceutical companies and research laboratories. Each of the market segments has been extensively analyzed based on market-related factors such as rise in use of robots in the pharmaceutical sector and benefits offered by automation of the pharmaceutical sector. Moreover, historical year-on-year growth has been taken into consideration while estimating the market size. The market size and forecast in terms of US$ million for each segment have been provided for the period from 2016 to 2026. The report also provides the compound annual growth rate (CAGR) percentage for each market segment for the forecast period from 2018 to 2026, considering 2017 as the base year. The market overview section of the report explores market dynamics such as drivers, restraints, and opportunities that currently have a strong impact on the pharmaceutical robots market and are likely to influence the market in the near future. Market attractiveness analysis has been provided in the market overview section in order to explain the intensity of competition in the market across different geographies. The competitive scenario among different market players is evaluated through market share analysis in the competitive landscape section of the report. All these factors are expected to help market players take strategic decisions to strengthen their positions and enhance their shares in the global pharmaceutical robots market. Based on geography, the pharmaceutical robots market has been segmented into North America, Europe, Asia Pacific, Latin America, and Middle East & Africa. The market size and forecast for each of these regions have been provided for the period from 2016 to 2026, along with their respective CAGR for the forecast period from 2018 to 2026, considering 2017 as the base year. The report provides market size and forecast for major countries in the respective regions. A detailed qualitative analysis of factors responsible for driving and restraining the market expansion and future opportunities has been provided in the market overview section. It also provides market attractiveness analysis and market share analysis of key players, thus presenting a thorough examination of the overall competitive scenario of the global pharmaceutical robots market.